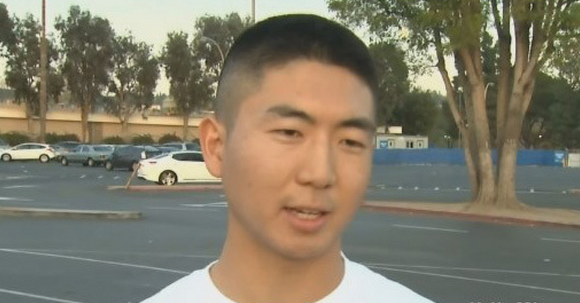 Anti-Asian slurs are shouted at the Foothill High senior during a game at Esperanza. Reed Nakakihara seems to be taking an ugly incident in stride, showing a keen sense of humor on Twitter. The principal at Esperanza High in Anaheim said the school would investigate the behavior attributed to his students during last Friday’s 61-57 win for Foothill. Reports said the taunts were coming from the Esperanza student section and directed at Nakakihara. “This is un­acceptable and we’re emba­rassed,” Espe­ranza principal Dr. Ken Fox said on Feb. 2. Nakakihara, who is the only player on his team of Asian descent, said in a television interview that he wasn’t entirely sure what was being said. “I’d love to see the fans be able to chant things whatever they want, but they should refrain from when they get personal about race, maybe back off about that,” he said. Nakakihara scored 17 points in Foothill’s come-from-behind vic­tory. Last month, Foothill issued an apology to Tustin High after one or more students held up a sign with a derogatory slur for Hispanics during a boys’ basketball game. At Tustin on Wednesday, Cypress senior Matthew Sun made both of his three-point shots for six points, but his team fell to Tustin, 55-38. Brother Michael Sun added two assists. Aaron Ogata hit for 13 points in North Torrance’s 72-65 win over West Torrance. Kregg Maruyama had 18 points and Kent Hirano six for West. On the girls’ court, Walnut’s Alena Koay led all scorers with 29 points, but it was Nicole Nishimura and Diamond Ranch who came away with the 58-56 win. 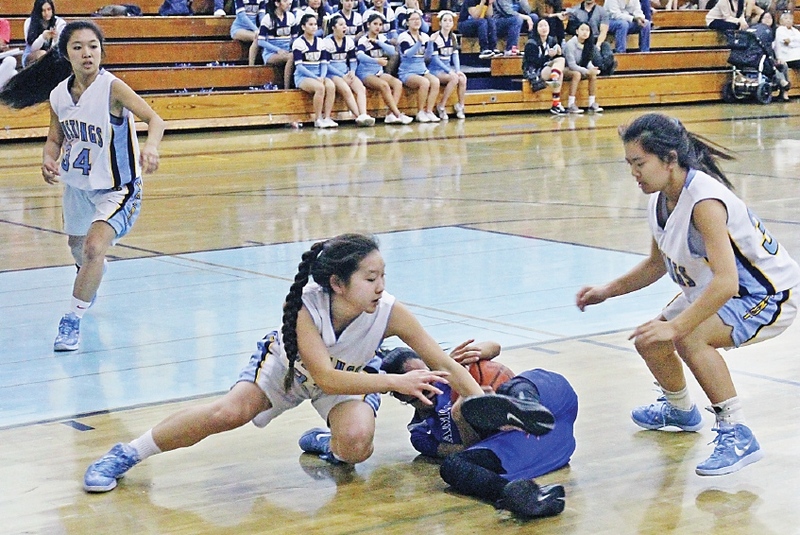 A turnover forced by Walnut’s Kim Mayekawa brought the Mus­tangs to within four points before halftime. Diamond Ranch had a two-point lead with only 25 seconds left in the game, but were able to hold off the Walnut offense. Corie Pitpit had five points for Walnut, with Mayekawa adding two. The Diamond Ranch Panthers improved to 3-4 in the Hacienda League play, with Walnut at 5-2 and in second place. North Torrance’s Kylie Oshiro seems to have gotten the advice she needed from head coach Lauren Kamiyama. Oshiro was on fire Wednesday, scoring a season-high 25 points, including five 3-pointers, in the Saxons’ 48-40 victory over visiting West Torrance. Having seen may of Oshiro’s shots fall short, Kamiyama made a few simple adjustments, including having her take one or two more steps forward before shooting. Katelyn Serizawa had eight points for North, with Rylie Kamiya adding two. Hayley Tanabe finished with 10 points for West, while Kayla Sato had six, Bailey Kurahashi three, and Katherine Fukuda two. South Torrance got 18 points and six steals from Kasey Takahashi in a 71-35 victory at Centennial. Ashley Sasaki finished with 10 points as Torrance handled Leuzinger, 42-25. In a thriller at El Segundo, Paige Endo scored 25 points against visiting Culver City in a 42-40 win. Erin Tsuji had 15 points for Roll­ing Hills Prep, who fell in overtime to Lennox Academy, 37-36. Paige Endo actually plays for El Segundo, not Culver City. Yep, a slight typo there … should be “against” and not “for” Culver City. Thanks, Ron!